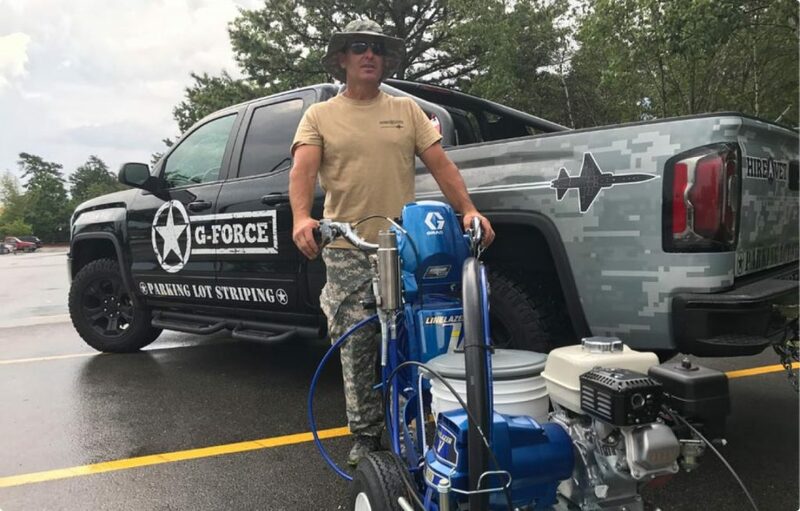 G-FORCE™ was founded by a 10 year Military Veteran with eight years’ experience in the Pavement Maintenance, Parking Lot Striping and Franchise industries. With headquarters in Bedford, New Hampshire, G-FORCE™ Parking Lot Striping services Greater New England (Southern New Hampshire, the Seacoast of New Hampshire, Northern Massachusetts, Greater Boston, Central and Western Massachusetts, Southern Maine and portions of Connecticut and Rhode Island). Our first Franchise outside of New England, G-FORCE™ Parking Lot Striping of Tampa, is owned and operated by a husband and wife team with over 18 years combined in the US Army and Army National Guard. Our second franchise, G-FORCE™ Parking Lot Striping of Pittsburgh covers Pittsburgh, Pennsylvania and the surrounding areas. Two brothers, both Combat Veterans, manage this location. We are your go-to resource for all your pavement marking needs. Our crews are neat, uniformed, reliable and dedicated to first rate customer service and expert results. We use State-of-the-Art Graco® Line Striping machines and premium traffic paints applied to manufacturer specifications. We take great pride in our line striping work and attention to detail. We’ve combined our industry and military experiences to create a unique, low-cost franchise business opportunity for veterans and veteran family members. Each franchise location is independently owned by Military Veterans.